Cube 2: Sauerbraten Trooper Edition has been released [download]: new logo, new maps, new weapon looks, bots! (from BloodFrontier), movie recording function (I have to check this out ASAP), rag dolls, new music, and so much more. 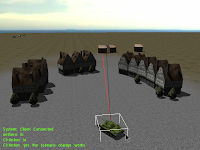 The tank simulation engine Mark IV [project, web page, blog] v0.80 Alpha-1 is out and first-time playable over network. It however uses FMOD (which can be avoided, see this) and RakNet. Windows users will be able to use the pre-compiled binary. Atomic Worm has recently been open sourced. It appears to be a Pacman-Snake mix plus different grid types plus the visual style of Transcend. Source available here. It uses the PopCap Framework, which appears to be free software. The Damn Small Nexuiz (DSN) project provides a slim version of Nexuiz with the aim to make it playable on netbooks. Deja Vu? Speaking of reduced weight: Spring RTS Engine Portable is a win32 Spring (RTS engine) package that doesn't touch the registry. Brilliant post Q. Sorry I'm so quiet atm. Overrun with work. typo: "don't not know" -> "don't know " or "do not know "
Fellow adventurer, turn back while you can!